Pianist François-René Duchable was born in Paris in 1952. He studied at the Paris Conservatory, and at the age of 13 won the institution’s first prize in piano. Three years later he placed 11th at the Queen Elisabeth of Belgium competition in Brussels, and in 1973 he won the Prix de la Fondation Sacha Schneider; at that time Duchable caught the attention of the legendary Artur Rubinstein, who encouraged him to pursue a solo career and helped him secure his first important engagements. Since then, Duchable has enjoyed an uninterrupted and highly succesful concert career in Europe, the United States, Canada, and Japan. 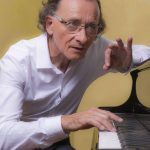 Duchable has been recognized for his performances of a wide swath of the standard repertory, including the concertos of Beethoven, Brahms, Schumann, Bartók and Ravel, and solo piano works of Liszt, Chopin, and Poulenc. He has appeared at many prestigious music festivals, including those of Salzburg, Lucerne, Berlin, the London Proms, Lockenhaus, and the Flanders Festival, and has presented concerts at London’s Royal Festival Hall, the Philharmonie in Berlin, and the Musikverein in Vienna. As an orchestral soloist, Duchable has performed with the London Philharmonic, the Berlin Philharmonic, the Rotterdam Philharmonic, the Orchestre de Paris, the Orchestre de la Suisse Romande, and the Montreal Symphony. While he claimed to be quitting music in 2003, recordings of his prior performances were still being released, including The Very Best of Chopin (2006) and Zen Classics (2008).